Heat styling is all the rage, and probably will always be. Blowouts, flat ironing, wand curls-you name it! Sleek and shiny looks boost your confidence and make you feel beautiful. But what’s the point in having straight hair if it only gives you limp, lifeless, damaged hair? A good heat protectant is the foundation of safe heat styling, letting you get great results and keep your beautiful, healthy hair. Here’s a list of 8 of the top heat protection spray on the market today that have had amazing reviews, and I am sure you find the best for your hair no matter it is fine, natural or curly. 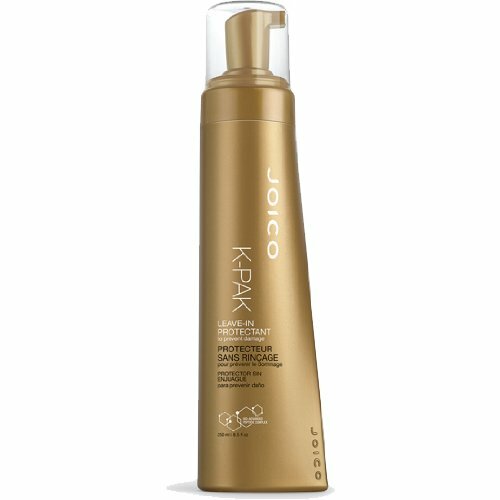 This hairspray by Joico sells at around $16 for ten ounces, so the price isn’t that bad at all. It also contains hydrolyzed keratin proteins to protect the hair shaft, and has antioxidants and botanical extracts to moisturize and strengthen your hair from the inside out, making it able to withstand heat even more. The spray gives your hair moisture and shine, and can be used to blow-dry, flat iron or even to set a finished style! It provides all-day hold with no stickiness, and is a great choice if you want to flat iron your hair and then curl it or do an up-do. With dihydroxypropyl peg-5 linoleammonium chloride extracted from vegetables it will prevent tangling and thermal heat damage. The Illumai Vibrant Primer Mist is another lightweight heat protecting spray. It’s ideal for all hair types, whether ethnic, straight or color-treated, and even extensions! It’s easy to use and can cut your styling time in half by making your hair easier to work with. This spray conditions hair while protecting it, adding shine and moisture. It can even be used to detangle your hair before flat ironing! However, this product is on the expensive side – about $22 dollars. Also, it’s free of silicones, which means there isn’t that essential barrier between your hair and the heat. This opens your hair up to the risk of being damaged or fried by your flat iron. The mist has great features and makes hair feel healthy, but for the price and the lack of silicones, it may not be the best choice for fine or ethnic hair. 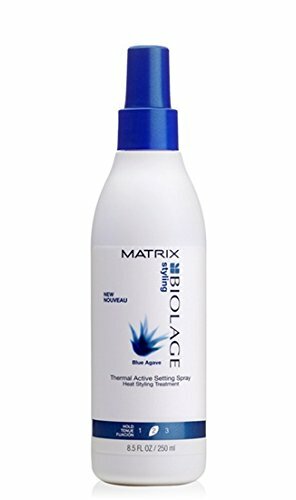 The Matrix Biolage Thermal Active Setting Spray is a non-aerosol thermal styling spray that’s perfect for use on wet, damp or even dry hair. It contains silicones and copolymers that create the much-needed barrier between the hair and your flat iron, and also contains nettle extracts and panthenol for moisture and strength. The spray has a light hold and a great smell, and can be used on fine hair to give body and volume without the greasiness and weight. It sells at about $16 for 8 ounces, which isn’t cheap but isn’t expensive either, but this spray can give hair a dry, tangled feeling. It doesn’t have much slip, so it can be difficult to comb through hair with or to blow-dry with. All in all, the Matrix spray may be great at giving your hair moisture and protection, but its texture and price are a bit of a sore spot. Aussie’s Heat Protecting Spray is one of our winners on the list. It offers a load of benefits and guess what? It’s only $4 or so for 8.5 ounces! If the price alone doesn’t draw you in, the effects sure will. The Aussie spray makes hair soft and shiny, adding moisture to your hair shaft to protect it from being dried out and damaged. It also has silicones that protect your hair from being fried by the heat of your flat iron or blow dryer. It also contains oils like castor oil that add thickness, shine and moisture to hair strands. The Aussie is a clear success – the price is amazing and it protects your hair from damage and dryness while making it soft and shiny. Win-win! 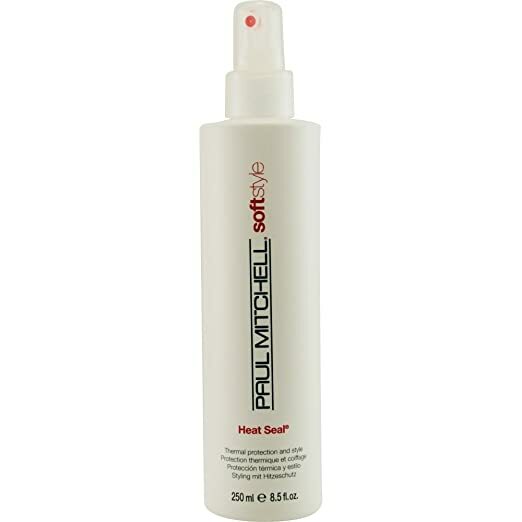 Heat Seal by Paul Mitchell is one of the more popular brands on the list. Like the Matrix Biolage Thermal Active Setting Spray, it also sells at about $16 for 8.5 ounces, so it’s pretty affordable. The Heat Seal adds body and shine to any hair type while simultaneously taming frizz and giving hair incredible hold that isn’t stiff. It contains fatty acids that help to make hair smooth and healthy, while giving moisture to your hair shaft. It’s also humidity resistant, meaning that once you flat iron or blow out your hair using this product, even the rainiest or most humid of days won’t ruin your sleek look. For the health and environmentally conscious people out there, the Heat Seal is also gluten and paraben free. It’s also cruelty free – it’s made with only vegan ingredients! And if you’ve got colored hair, don’t worry. This product is color safe so it won’t wash out or damage your vibrant color in any way. This heat protectant by Tresemmé is one of the most popular ones on the market today. It usually retails at about $10 for 8 ounces, which is very affordable when compared to other heat protectants of the same size. This product can be used for either blow-drying or flat ironing. It has a great smell, not too overpowering. Keratin strengthens your hair from within, and as the name suggests, the spray contains keratin protein and silicones to help protect your hair against heat damage, ensuring that you won’t end up with fried, stringy hair. It also contains glycerin, a humectant that leaves you with smooth, shiny and moisturized hair, even after flat ironing. This product is great overall – it has a good price and delivers amazing results. This product is a leave-in conditioner that doubles as a heat protectant. It has silk proteins and silicones to form a barrier against heat while still allowing maximum straightness, and you don’t need much for it to work on your hair – just a drop does the trick! It smoothes all frizz and leaves hair shiny and tame, with no fly-aways or static. However, it’s a bit on the pricey side, retailing at anywhere from $15 to $20 for only six ounces. It’s also a bit oily, which may cause your hair to be weighed down and greasy if you’re a fine haired girl, or even if you use too much. The smell is rather strange, sort of sweetish, but this isn’t a con for every user. All in all, the CHI heat protectant has great features, but is rather expensive and may be a bit too oily for you, depending on your hair type. GHD’s spray is a lightweight heat protectant that gives your hair moisture and shine without weighing it down. It has a really nice scent – it’s sort of botanical! It also has no oily residue, so you won’t have to worry about greasy, weighed down, limp hair or greasy hands from touching or even fixing your hair. It contains proteins to strengthen and protect your hair from damage, and a huge plus – there’s castor oil in it too. Castor oil is great for shine, thickness and moisture. This spray gives a silky smooth finish with no heaviness, but there is a major con: the price. GHD’s spray sells for about $19 us for only 4.1 ounces! It surely has great ingredients and features that work well for your hair, but the price is a factor to consider. This spray contains PVP/DMAPA acrylates copolymer, an essential ingredient, which works brillantly to prevent your hair from damge. If you have ever visited a hair salon, any hair stylist will tell you that one of the important step needed to be done to eliminate damaging and hair breakage. You will notice that your hair becomes a little drier or curlier than usual if you skip this important step, applying heat protectant, since your strands were exposed to the heat they should have not be. Do they just simply prevent potential heat from hot styling tools? Not just that, they include a lot of useful ingredients, which also add shine, and smooth out your hair. Frequently using hot styling tools like hair straightener, curling iron and hair dryer will make your hair loose its natural look, moisture, oil and important vital protein, even cause further damaging in hair structure. These are necessary ingredients to provide your hair smooth and shiny look. To preserve those ingredients and reduce the heat damaging as much as possible, you should apply spray your hair with heat protection spray period to hair straightening. Internal moisture of your hair starts to evaporates, yes they are leaving. The chromophores, which defines how shine your hair is, are about to degrade. As long as the hair is exposed to hight heat, the hair structure and its surface breaks, radically. It even become worse if you straighten wet hair. A study conducted by the Journal of Cosmetic Science revealed that heat protection spray with ingredients like PVP/DMAPA acrylates copolymer and Hydrolyzed wheat protein does have protective effect. However, the machenism how heat spray penetrates into hair structure and strengthen it at high temperaure is still not known. But possibly, they will limit the chemical reaction and prevent over-heating hair by buffering coating. An article – The effects of water on heat-styling damage published on NCBI suggests that heat protectant spray should contain less water in order to prevent heat damage caused by water. In favour of volatile ingredients such as ethanol. Interesting post, you mentioned at end of the post the fact that heat protection sprays are effective for protecting hair. But does it work the same for all hair types. My hair is very thick and curly, my friend hair is thin. She said the hair protectant is useless her. I have fine hair which heat protectant should I use?